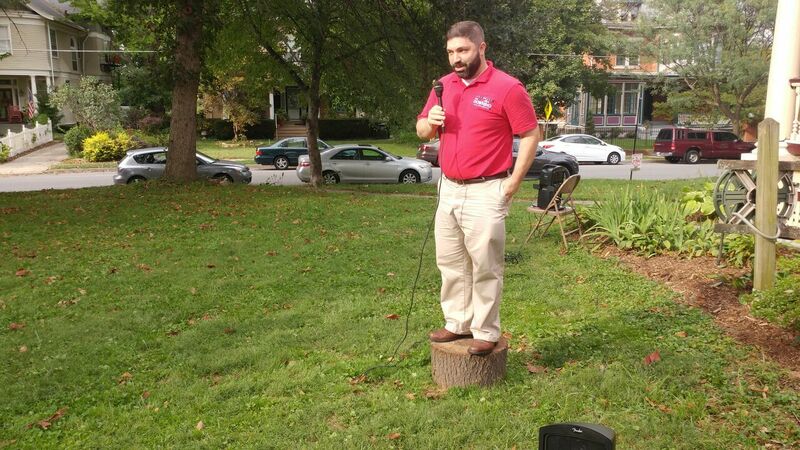 In a uniquely Covington event, candidates for mayor, city commission, and board of education took to a literal stump on Sunday afternoon to make their case to voters. 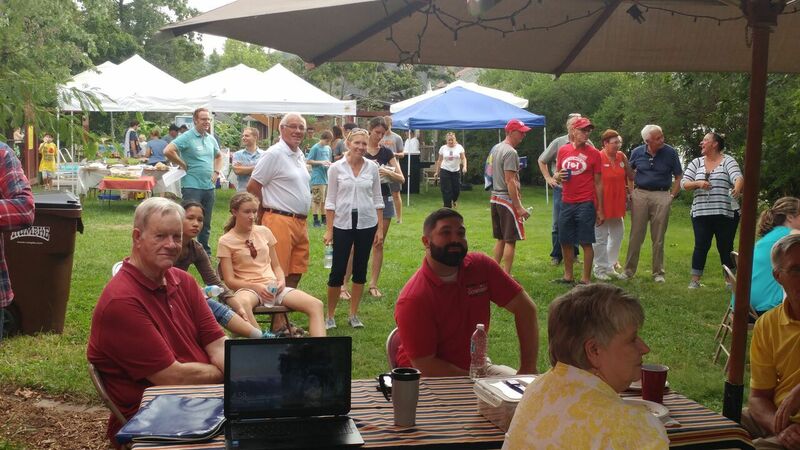 The Wallace Woods Corn Roast takes place each election cycle and attracts candidates looking to get an early jump on messaging as the fall campaign season kicks off. Christopher Gastright, president of the Wallace Woods Neighborhood Association, welcomed the event to his home on Wallace Avenue this year. 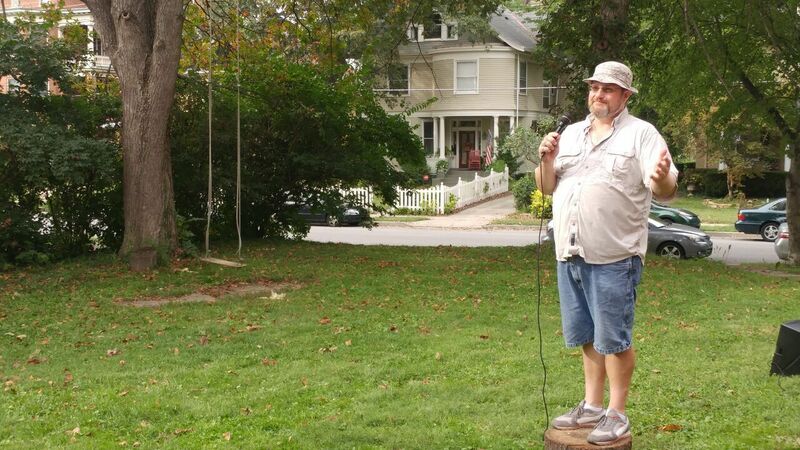 He promised candidates a safer, sturdier stump this year. 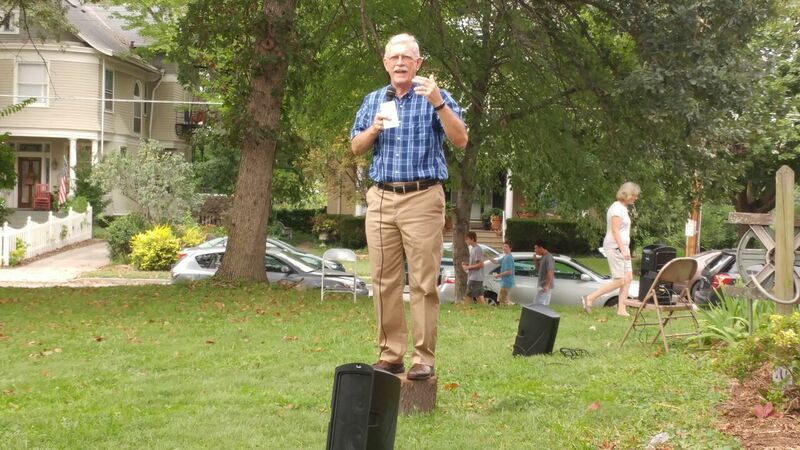 "That stump over there," Gastright said, pointing to one used previously, "almost killed (Kenton County Commissioner) Jon Draud." City arborists provided the new stump, Gastright said. "Otherwise, I'd have had to buy another new stump on Craiglist. Stumps on Craigslist can be sketchy." 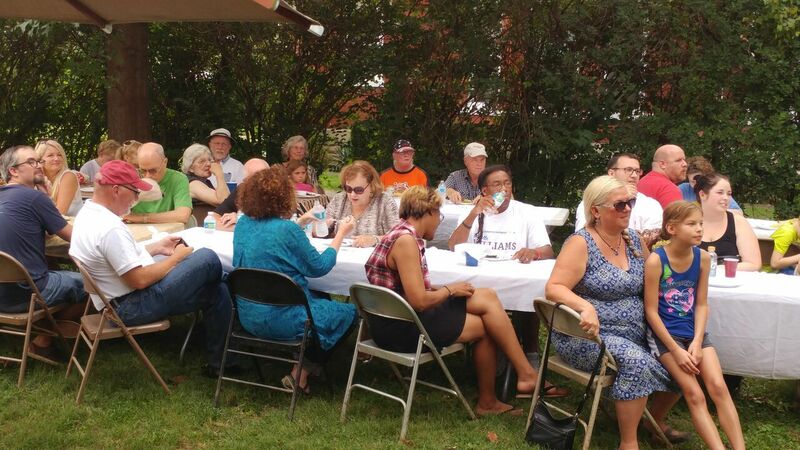 Though the event is a mostly light, summertime gathering with grilled foods, drinks, and chit chat, it's often the first chance voters get to hear the messaging that will play out over the ensuing weeks that lead up to Election Day. The battle for Covington mayor has been quiet since the May primary, when challenger Joe Meyer bested incumbent Sherry Carran, 47 to 40 percent, and eliminating two lesser candidates to set up a one-on-one autumn showdown. 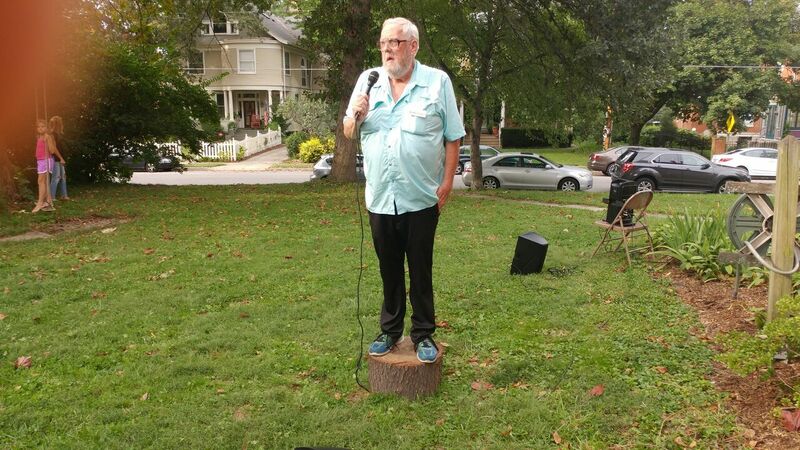 So, what would their message be as they took to the stump in Wallace Woods on Sunday in front of a few dozen spectators? Firm, but cautious, it turns out. Neither candidate threw any bombs or landed any significant punches, but the direction the candidates will likely take their message was on display. Meyer will argue that good things are happening in the city, but uncertainty like that created by the IRS's elimination of more than 1,600 jobs from Covington by 2019, will require an experienced hand - one that he claims to offer after decades in Frankfort. Carran will argue that her leadership has resulted in new energy that has created a booming downtown - and that the course should be stayed. But it's not all rosy in Covington, Meyer will argue. 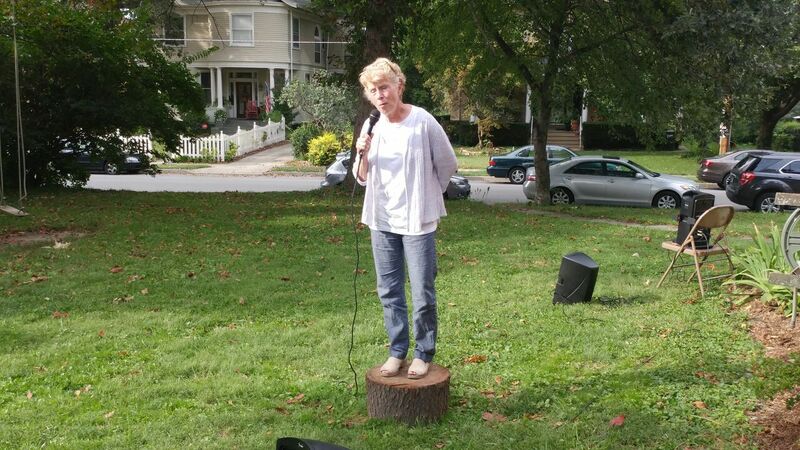 "We have some major issues to deal with," Meyer said, speaking first from the stump. He cited a concentration of homelessness, poverty, and low-income housing in the city. "These are all factors we need to come to terms with." He credited Wallace Woods for "dealing with some of them in a practical way", a nod to the neighborhood's efforts to get the city to conduct a small area study and to place a moratorium on new social service agencies opening nearby. Meyer said he will look to successful operations in Louisville and Lexington to reduce homelessness. "We're growing homelessness," he said of Covington. "I want our city to address these issues in an organized, systemic, and knowledgeable way so we can lay the foundation for the next 30 to 40 years of our growth," Meyer said. And then, "This has been a painful week for Covington." How will the city deal with the forthcoming job losses brought on by the shocking announcement from the IRS? "That's ten percent of the jobs in Covington today that will be lost," said Meyer, a state representative from 1982-88 and a state senator from 1989-96, before serving as secretary of education and workforce development under Governor Steve Beshear. There will be an impact on surrounding businesses, Meyer stated, not to mention the drain on the city's payroll tax revenue, its main source of funds. "We can't grow services that our people want without growth in jobs," he said. To replace the payroll tax lost with the departure of the IRS, property tax revenue would need to be increased by 25 percent, Meyer said. "That's not competitive. Those who say this is a great opportunity and that we're gonna hit the ground running in three or four years are engaged in politics, just pure political speechmaking," Meyer said. "I've been through this process before in closing down buildings and having them declared surplus. It takes three to five years after the property is vacated before it can be awarded to the next property owner." There's no guarantee Covington will control the site, he argued, and no guarantee that development would happen there, saying the site would be in direct competition with Ovation in Newport, a large swath of riverfront land that has sat dormant for a decade, but appears to be nearing development with the expansion of Kentucky Route 9. The IRS's news will be a "significant hardship for our community for the next ten to twenty years, and we should not kid ourselves about that," Meyer said. "The question for this election is what is the better choice, who is the better choice to lead this city during these troubled times." Meyer cited his credentials, claiming a role in luring Fidelity Investments and creating the Northern Kentucky Convention Center in Covington, and Newport on the Levee. He did not list these accomplishments "to brag," he said, "but to say I have the experiences and I would to offer them to make our community grow." 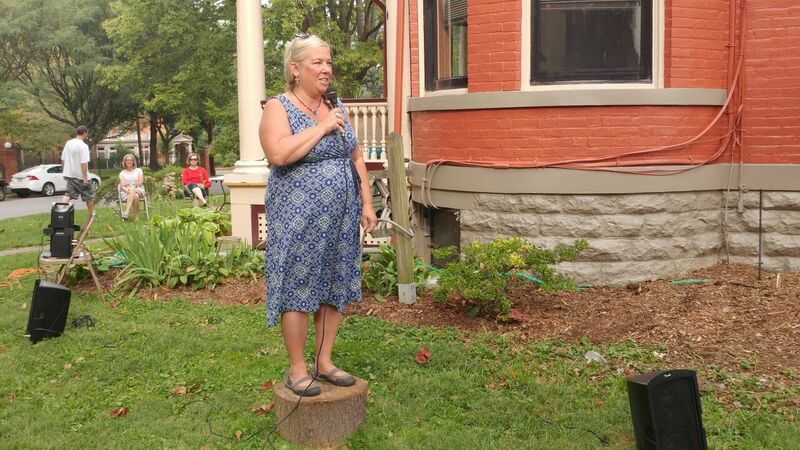 Carran followed on the stump, and read from notes, "because it's hard to stay on time." She said her 2012 election was hard, and that all elections are hard, but that this one "is probably a little more difficult." "There is a nasty element that I'm seeing that's being instilled in this race that I haven't seen in a very long time and that's hard to counter sometimes," Carran said. "We try to stay positive and focused, but that makes it difficult." She was able to quote her opponent: "As Joe said, there's been a lot of wind at our sails." "One of the things you see right now is young energy and people who are engaged in the community and we talk about walkability and quality of life, those are things I have been focused on way before I was involved on commission." Carran was first elected to the city commission in 2006 and was reelected twice before winning the 2012 race for mayor. Though the news of the IRS departure hurts, Carran cited positive jobs announcements in recent weeks, including more than 500 headed to RiverCenter when CTI Clinical Services relocates there from Blue Ash, Ohio, and the addition of more than 100 jobs when Huntington Bank relocates them from Crestview Hills. Property values are up, she said, and people want homes in Covington. It all really got going, she said, when the Hotel Covington project was announced in 2012. The $21.5 million redevelopment of the old Coppin's department store and City Hall will open at the end of the month. "Ever since then it's been nonstop with people wanting to invest in Covington." "During my time as mayor, not only does the city have a vision but it has the wherewithal to become a reality," Carran said. "We work with people and Covington is open to new ideas." There have also been investments in public services, the mayor argued. The three public unions representing police, fire, and other government workers have endorsed Meyer, but Carran said that 35 new police cruisers were just purchases, along with the hiring of 10 new police officers, and the process is underway to increase the base pay to make the department more competitive in the region. A new ladder truck, pumper, and ambulances are on the way to the fire department. She also noted the city's success in finally landing not one, but two residents on the board of Sanitation District 1, and the changes to the city's code enforcement department. She said 150 code cases were heard at City Hall two years ago, but that the number has more than doubled - to 350 - this year. "And those cases are being resolved, and we have a rental inspection program holding landlords accountable." Following the mayoral hopefuls, the candidates for Covington City Commission spoke. Incumbents Jordan Huizenga and Bill Wells were joined by challengers Christi Blair, Tim Downing, Stuart Warren, and Michelle Williams. John Flesch, a Wallace Woods resident, was said to be out of town. Robert Horine, who finished 7th and advanced with the field of 8 out of the May primary, later dropped out of the race altogether. The candidates are competing for four seats, two of which are being vacated by incumbents Chuck Eilerman and Steve Frank who are not seeking reelection to third and fourth terms. "I believe in not giving up," said Blair, speaking first, noting her two previous unsuccessful bids for office. 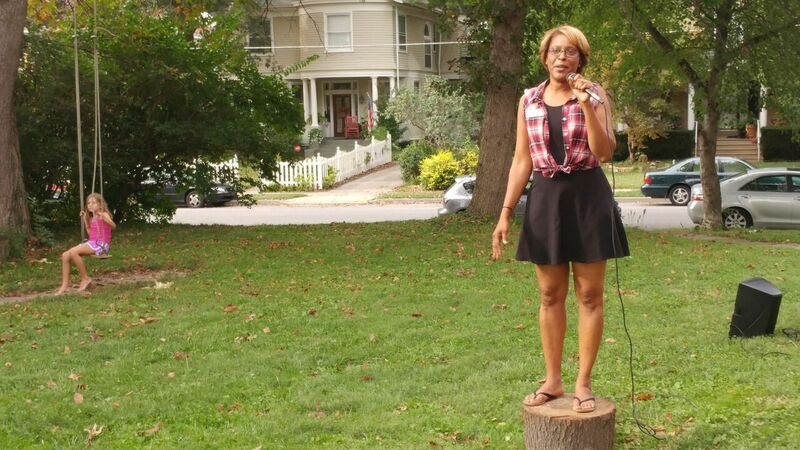 She finished near the bottom in the 2012 race for board of education and 8th in the 2014 race for city commission. She proved a stronger candidate in the 2016 commission primary, finishing fifth. "One of the places I didn't do well was Wallace Woods," she said. "Maybe many of you don't know me. I do better in one on one than public speaking like this. I have the gift of gab. I love to talk." Blair was endorsed by Covington's firefighters union. She lives in Latonia and works in real estate. She says she related to "the average Covingtonian" as a renter. "I think I identify with the average person, and that's basically who I represent." Warren, a resident of Wallace Woods, said that the top issue in the race now is the budget and how to address the forthcoming loss of IRS jobs. That's different than a week ago, he said, when he would have argued that the top priority should be to incentivize growth. "We have to make sure we have the right commission who is going to manage the budget wisely," Warren said. He also talked about how the region's heroin crisis has impacted his family directly and how he would participate in a regional effort to attack it. He already has good relationships with various levels of government officials in all three Northern Kentucky counties, he argued. The doctoral student at the University of Cincinnati is making his first run for office. 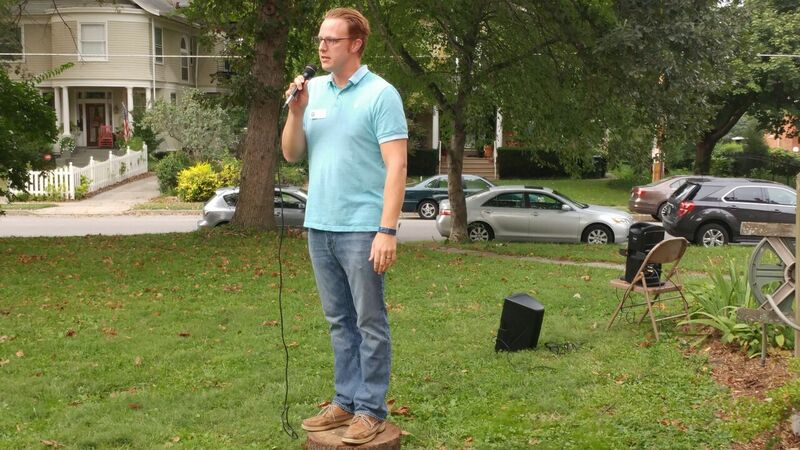 Tim Downing, the first-time candidate who surprised election watchers with his strong 4th place finish in the May primary, spoke confidently from the stump. "We definitely have the wind at our backs right now and with two candidates retiring at the end of the year, we are most undoubtedly going to face a lot of change with the way our commission is going to operate, so we have to take a long, hard look look at what kind of change we want to bring about," said Downing, a 20-year resident of the city who now calls South Covington home. Professionally, Downing is an analyst and works with data and forecasting, skills that he has applied to the campaign. "Part of my conversation has always been, what do you want to see changed? What is your goal? Because it can't just be mine, it needs to be everybody's," he said. He said that the city can't be busy with small fires, but has to be prepared with a comprehensive plan "that we approach logically." Williams, who was elected to the city commission in 2012 but defeated in her 2014 reelection bid, is looking to return to City Hall. She has been endorsed by all three public employee unions in her quest. "And all the other city employees want me in there, too, so keep that in mind when you go to the polls," she said. Her first term on the commission often resulted in butting heads with Carran and City Manager Larry Klein, and then the media when news surfaced that then-Kenton County Attorney Garry Edmondson was investigating whether Williams could legally hold the seat, based on her arrests and convictions on misdemeanor charges for drug possession and assault, as well as theft charges in the late 1980s during her time in the military. Then-Attorney General Jack Conway decided in favor of Williams. She finished fifth, one place shy of being reelected two years ago. This time around, she said she wants to expand the focus of the city government to all neighborhoods. "We seem to focus on pockets," Williams argued Sunday. "I'll spread the money out. We have all kinds of issues we need to bring up and that need to be paid for. I have a track record in Covington and you can come talk to me about anything and I'll fix any problem you have." Huizenga asked to be reelected, citing the city's better financial footing, investments in public safety, and economic development. 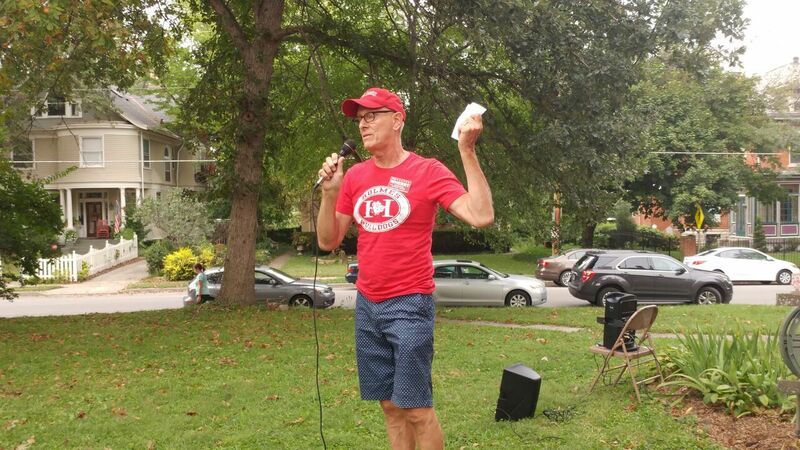 "These are good steps on making this a good, strong, safe community with good, safe streets. Those are the things I'm committed to as a commissioner," he said. Wells was the last commission candidate to speak. "I still consider myself a kid from Covington," Wells said, citing his city bonafides: swimming as a youth at Rosedale pool, playing at the American Legion, and attending Holy Cross. He gave a shout out to his wife from the stump on the occasion of their 38th anniversary - to which she informed him that it was only their 37th, much to the crowd's amusement. On the issues, Wells cited an attack on blight as an achievement. "Look around your neighborhood, you can see all the maintenance that is being done," he said. He cited the 21st Street Levee improvements and the addition of two Covington residents to the SD1 board, investments in public safety, and the financial stability ordinance passed by the commission. Continuing the theme, Wells said, "The wind is at our backs, and all I can say is, we need to stay the course." There are three seats on the ballot this November for the 5-member Covington Board of Education, and at least one will be occupied by a new face. Incumbent Joyce Baker, the top vote-getter four years ago, is not seeking reelection, but incumbents Glenda Huff and April Brockhoff are. They face challengers Tom Wherry, Danielle Axtel, and Mike Fitzgerald, who has served 16 nonconsecutive years on the board, but lost his last race in 2012. Huff and Axtell did not attend the Corn Roast. Wherry has spent eight years as a mentor in the school district and works with neighborhood kids. The Helentown resident said that he never dreamed he would run for office, but was approached last spring about considering it. His message: community, collaborative, individuals, advocate, options, oppotunities, trust, follow-through, and culture change. 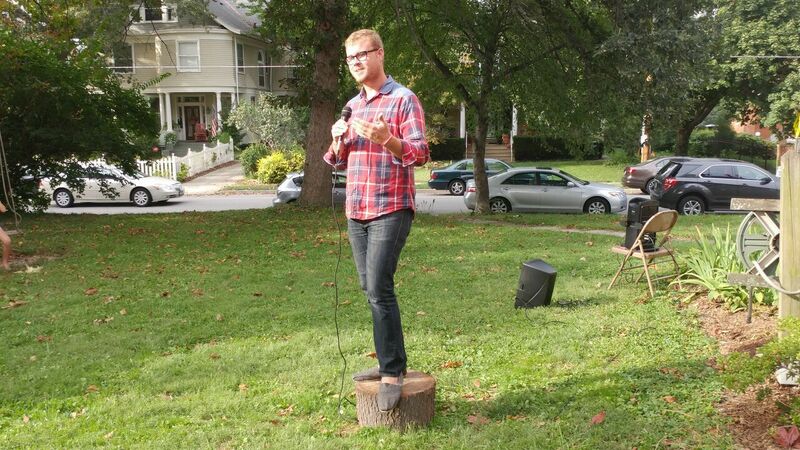 "If I've done nothing else, I've done my homework," he said from the stump. He has talked with the superintendent multiple times, all the principals, and many teachers - and is currently mentoring two students. "What I'm seeing is we need wide community support to help push these schools to the top." He cited Glenn O. Swing, which has seen drastic improvements in its test scores, making it the top public elementary school in Kenton County and in the 99th percentile in Kentucky. "There is a lot of good happening in the schools and there is more to do. We need to embrace these kids," Wherry said. 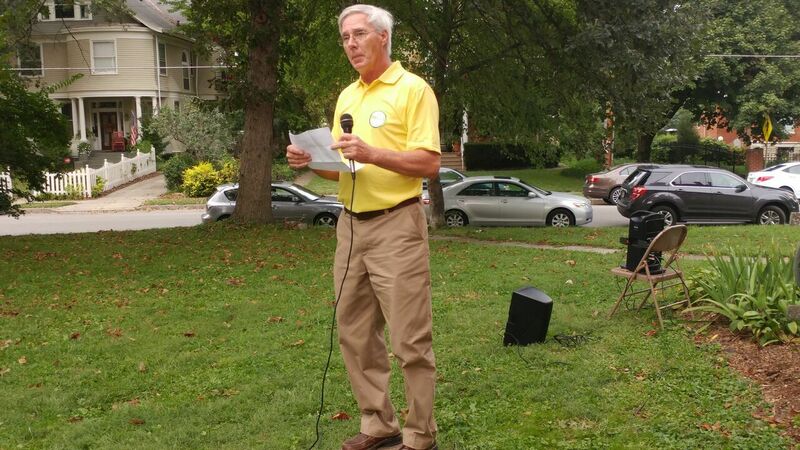 He urged Wallace Woods neighbors to develop relationships with the students who walk to and from Holmes High School, which sits in the neighborhood. "Show them that you truly care so that they truly believe and truly trust that folks have their backs, and help put wind at their backs. "Let's go and give these kids the opportunities that they deserve." "What a cordial bunch of folks I've met here today," Fitzgerald said as he returned to the campaign trail. He argued that the biggest problem in the district is that young people aren't being taught enough life skills, and that there is not enough support for special programs like music and arts. "We have fantastic children in Covington but one of the biggest problems is parental responsibility. A lot of these children today get in trouble, get involved in things they shouldn't because they don't have parental control at home," Fitzgerald argued. "They have no respect taught to them at home and we have to get back to the parents who are responsible for our future and our children, and if they're not helping they are hindering." Bockhoff, who was appointed in 2015 to fill Kerry Holleran's term when she resigned to move out of the district and was then elected in a special election last year, is seeking a full 4-year term. She has four teen children, all of whom have attended Covington schools throughout their education. Brockhoff has been a volunteer at the schools and served on site-based decision making councils. 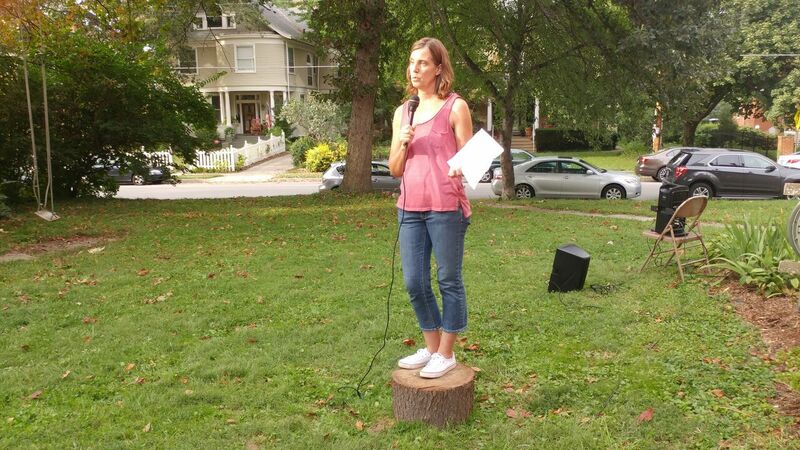 "I am navigating the learning curve from mom to district-wide decision-maker," she said from the stump. "I have one vote in our decisions. I don't have a three-point plan or a tagline on how to save our schools, so my approach is, when asked to approve or to vote on something, I base my decision on three criteria: what are the benefits and implications for our students, what are the benefits and implications for teachers and staff, and what are the benefits and implications for our community and taxpayers." She said the current board is working well together, and that new partnerships with Youth Build and the Brighton Center are promising. "One area I see for improvement in our board is, we have to become more proactive in addressing our district's needs," Brockhoof said, specifically talking about the teacher retention. Her time was up before more could be said. "I had so much more to say," she said, descending from the trump. All the candidates will have more to day throughout the coming weeks, and you can read about it here throughout the campaign at The River City News.